Do you live in Jerez de la Frontera? is a municipality in the province of Cádiz in the autonomous community of Andalusia, (Spanish: Andalucía) in southwestern Spain, situated midway between the sea and the mountains. As of 2013, the city, the largest in the province, had 215,180 inhabitants; it is the fifth largest in Andalusia. It has become the transportation and communications hub of the province, surpassing even Cádiz, the provincial capital, in economic activity. Jerez de la Frontera is also, in terms of land area, the largest municipality in the province, and its sprawling outlying areas are a fertile zone for agriculture. There are also many cattle ranches and horse-breeding operations, as well as a world-renowned wine industry. The city is located 12 km (7.46 mi) from the Atlantic Ocean, in theCampiña de Jerez, region appropriate to cultivate the vineyards that produce the famous sherry. It pertain to commonwealth Municipios de la Bahía de Cádiz with a metropolitan area of over 650.000 inhabitants. Some famous places in to the city are Alcazar of Jerez, Church of San Miguel, Charterhouse of Jerez, the Cathedral of San Salvador. Since 1987 the Grand Prix motorcycle racing in Spain is celebrated in the Circuito de Jerez in early May. In these days, the city receives thousands of bikers from around the world. The same circuit has hosted several Formula 1 Grands Prix, including the 1997final race of the season, which was marred with controversy for a notable high-profile championship-deciding incident. 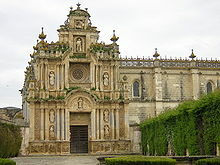 Other popular festivals in the city are Feria de Jerez or the Holy Week in Jerez. View of Cathedral and bodegas. The economy of Jerez has traditionally been centered on the wine industry, with exports of sherry worldwide. Because it lacks the civil service that other cities enjoy, Jerez has based its economy on industry. The cultivation of fruits, grains, and vegetables and horse and cattle husbandry has also been important to the local economy. It is the home base for the Spanish Military Stud farm, the Yeguada Militar de Jerez de la Frontera. After the wine crisis in the 1990s, the city is now seeking to expand its industrial base. Tourism has been successfully promoted. The city's strong identity as a center for wine, flamenco, and horses, its popular festivals, MotoGP hosting and its historical heritage have contributed to this success. The city is the home of Jerez Airport and has also been positioning itself as a logistics hub for western Andalucia, through the integration between the airport, the rail system and nearby ports. In May 2012, Time Magazine profiled Jerez as the most indebted town in Spain, the vanguard of Spain's impending economic collapse and the consequent dissolution of the European Union. Traces of human presence in the area date from the upper Neolithic, and humans have inhabited Jerez de la Frontera since at least the Copper or Neolithic Age, but the identity of the first natives remains unclear. The first major protohistoric settlement in the area (around the third millennium BC) is attributed to the Tartessians. Jerez later became a Roman city under the name of Asta Regia. After the fall of the Western Roman Empire, the Vandals and the Visigoths ruled it until theArabs conquered the area in 711. In the 11th century it briefly became the seat of an independent taifa. Some years later 'Abdun ibn Muhammad united it with Arcos and ruled both (ca. 1040-1053). In 1053 it was annexed to Seville. From 1145 to 1147 the region of Arcos and Jerez briefly operated as an emirate under dependency of Granada, led by Abu'l-Qasim Ahyal. Later the Almohads conquered the city. In the 12th and 13th centuries Jerez underwent a period of great development, building its defense system and setting the current street layout of the old town. In 1231 the Battle of Jerez took place within the town's vicinity: Christian troops under the command of Álvaro Pérez de Castro, lord of the House of Castro and grandson of Alfonso VII, king of Castile and León, defeated the troops of the EmirIbn Hud, despite the numerical superiority of the latter. Castile conquered the city in 1264. The discovery of America and the conquest of Granada, in 1492, made Jerez one of the most prosperous cities of Andalusia through trade and through its proximity to the ports of Seville and Cádiz. Despite the social, economic and political decadence that occurred in the seventeenth century, towards the end of the Habsburg rule, the city managed to maintain a reasonable pace of development, becoming world-famous for its wine industry. Church of San Lucas, built over an old mosque.